I definitely hit a grand slam with these Chocolate Chip S’Mores Bars. 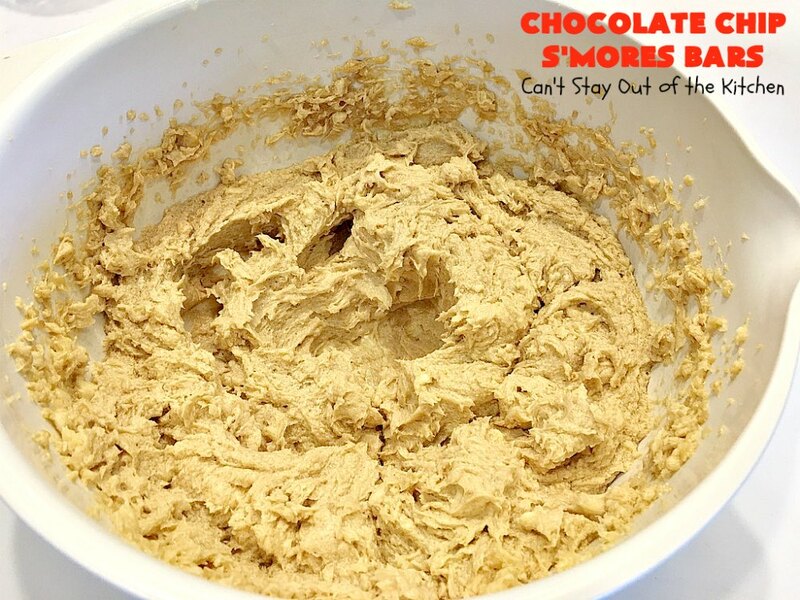 They are so chocolaty and filled with the new and delightful Hershey’s S’Mores Baking Pieces. 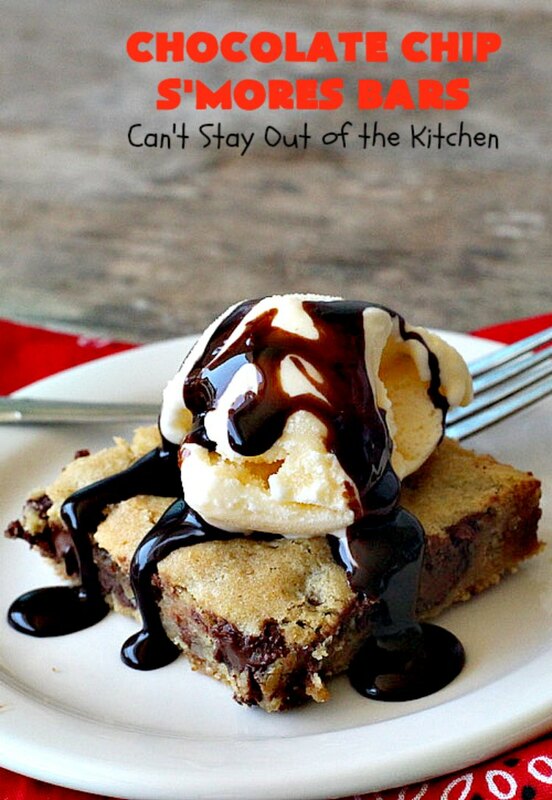 They are absolutely some of the best brownie-type cookies you’ll ever eat. 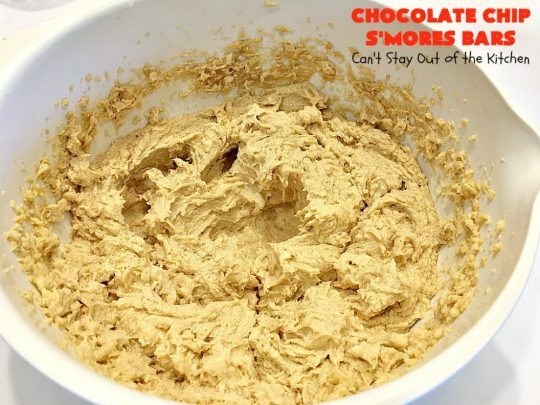 Especially if you’re a S’Mores fan. 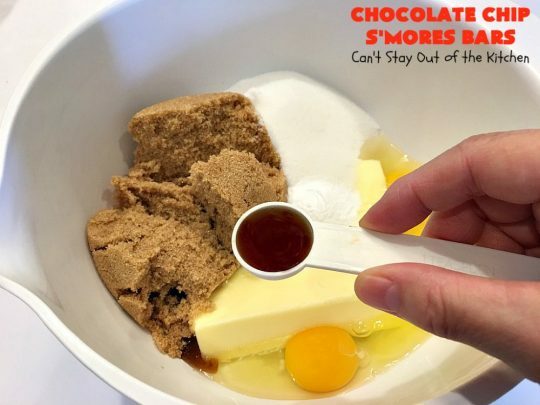 The S’Mores Baking pieces include chocolate chips, miniature marshmallows and small square-shaped graham cracker pieces. 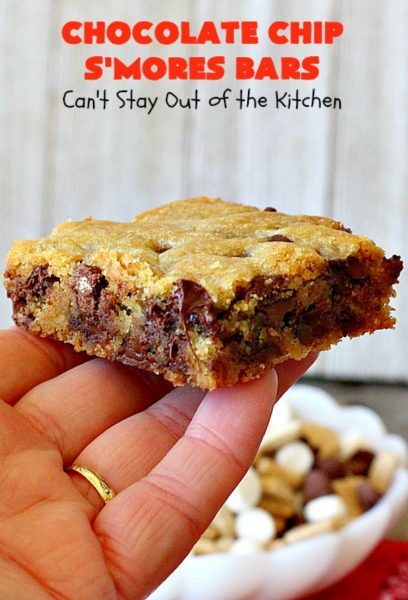 Truly they’re wonderful in cookies and brownies. When I saw two bags of S’Mores Baking Pieces at a local Walmart a few weeks ago, I snatched them up immediately. A few weeks after that I found that Wal-Mart had restocked and they had several more bags, so I bought a couple more bags. Not every Walmart carries these S’Mores Baking Pieces. However, we have one store in Cedar Hill, not too far away that carries a lot more choices than other Walmarts. I made four large batches of this S’Mores recipe and baked them in 13 x 17 1/2-inch cookie sheets. 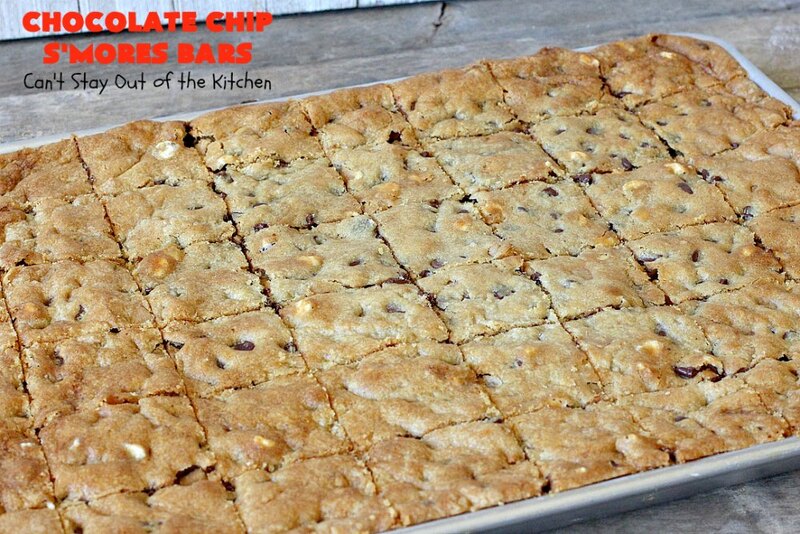 Each pan yielded 48 bars. Then I quickly packed them up so I wouldn’t eat ALL of them. Even a few nibbles were addictive. A while back my husband noted that our freezer was getting pretty low on cookie containers. He likes to have them available to give out frequently to co-workers and friends. 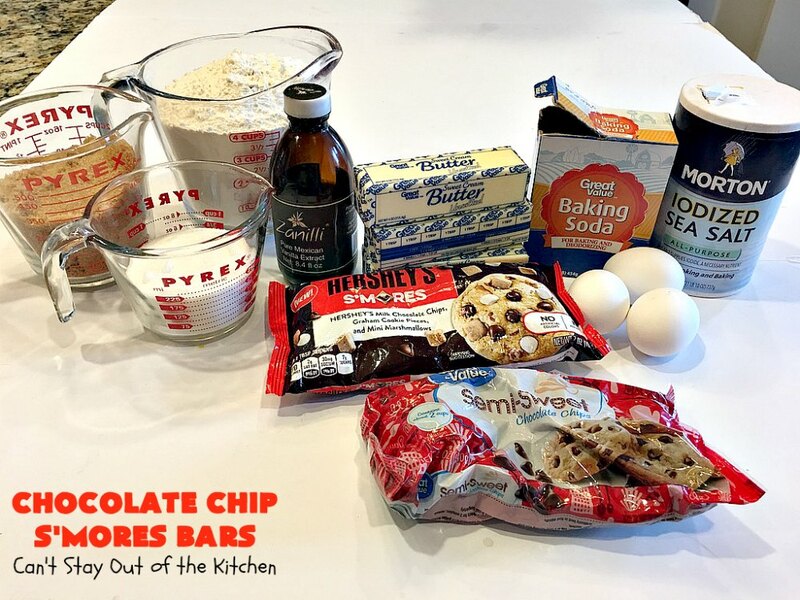 So I started with a wonderful chocolate chip cookie recipe and included these S’Mores Baking pieces along with chocolate chips. I was extremely pleased with how these brownies turned out. In fact, they totally exceeded my expectations. 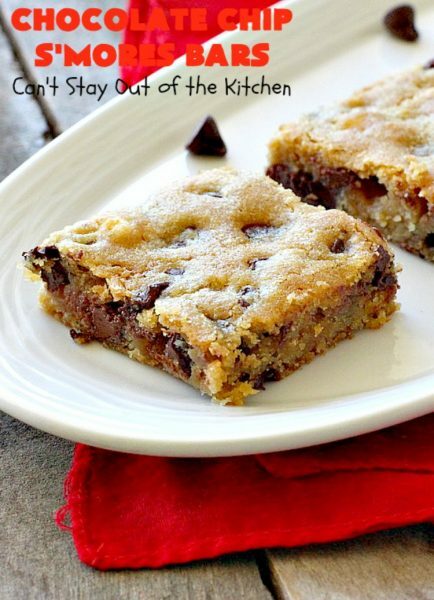 I love a good chocolate blondie or brownie and these really hit the spot. 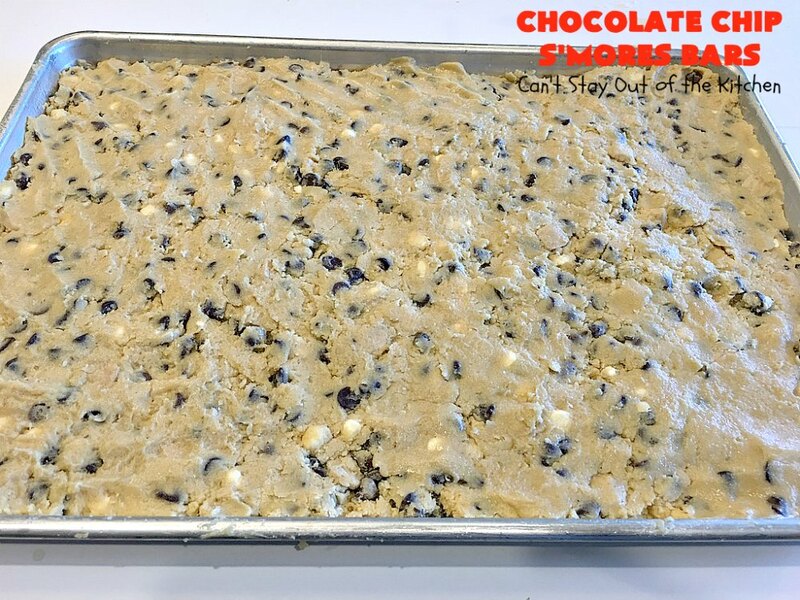 If you’re looking to wow your company or friends this fall, Chocolate Chip S’Mores Bars will do it. I assure you, your tailgating friends will love these goodies. 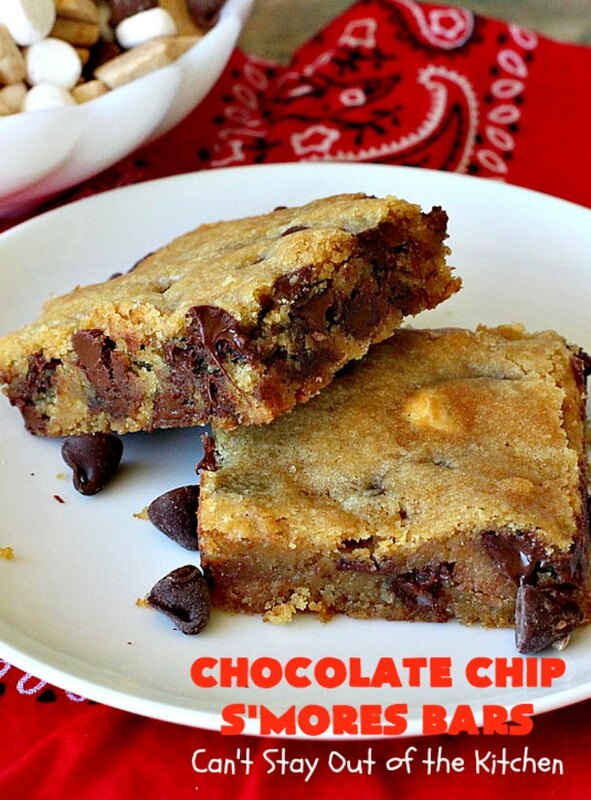 Plus it’s a terrific way to use these new baking pieces in a recipe. We sure enjoyed them. But believe me, once you start handing out these treats, you won’t have any left. They’ll be gone in a jiffy. 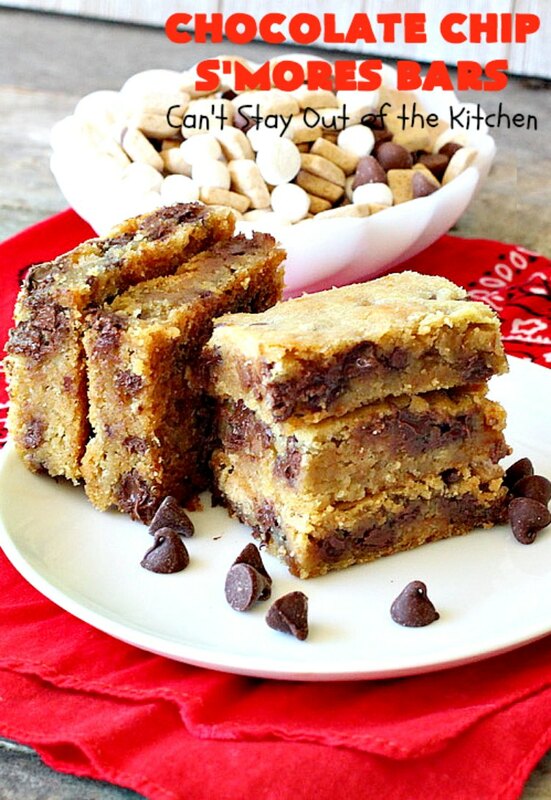 Chocolate Chip S’Mores Bars are absolutely awesome! 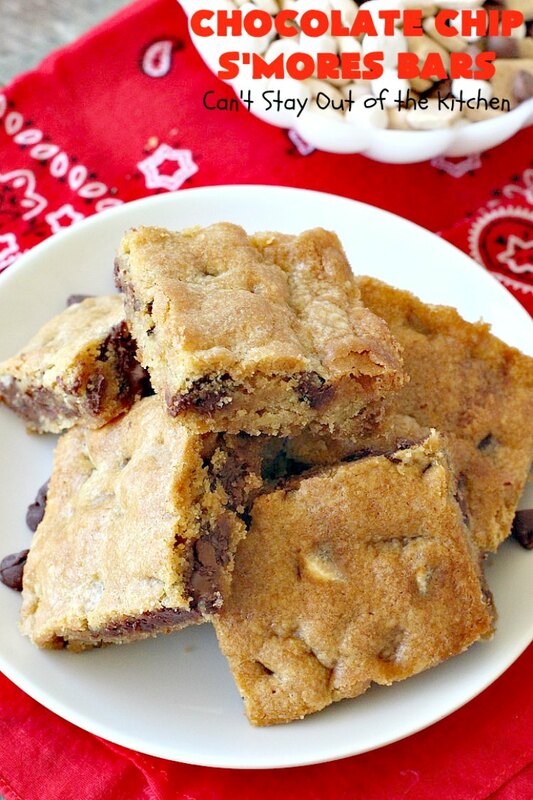 These delicious brownies are wonderful for tailgating parties. If you haven’t seen the Hershey’s S’Mores Baking Pieces, this is what the package looks like. 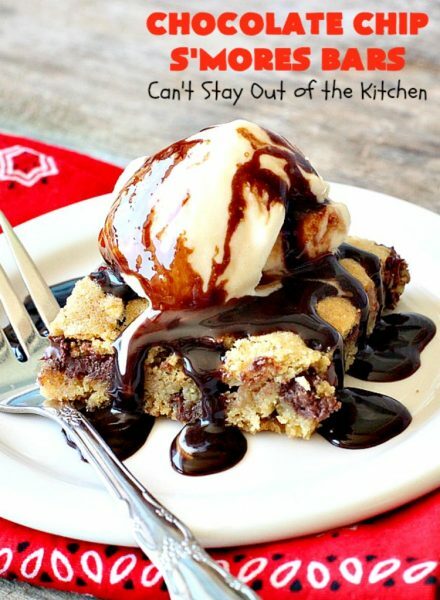 These brownie-type cookies are fabulous served with ice cream and chocolate sauce. Because this recipe makes 48 brownies, this is a great dessert for potlucks and backyard barbecues. All your friends and family will love these jewels. Soften butter. 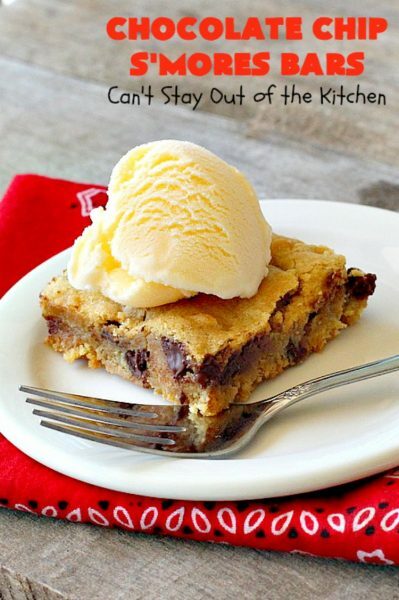 Add sugar, brown sugar, baking soda, sea salt, eggs and vanilla. Combine with an electric mixer until smooth. Add UNBLEACHED all-purpose flour. Bleached flour toughens baked goods. Add chocolate chips and Hershey’s S’Mores Baking Pieces. Grease a 13×17 1/2″ cookie sheet. 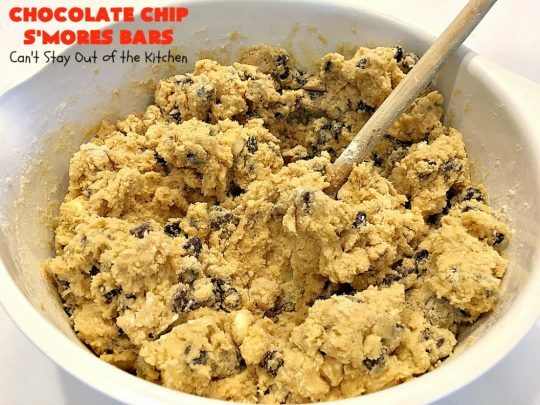 Spread cookie dough into prepared cookie sheet. (I had to use moist hands to keep the dough from sticking to my hands. Bake at 350 for 30-40 minutes or until a toothpick inserted in center comes out clean. Serve a la mode with chocolate sauce, if desired. Chocolate Chip S’Mores Bars are certainly drool worthy. 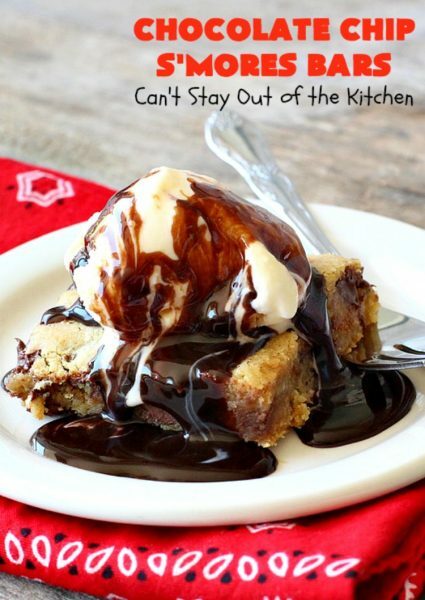 If you enjoy chocolate and s’mores, you’ll love these delicious brownies. These delicious Chocolate Chip S'Mores Bars are so mouthwatering you will be drooling after the first bite! They're filled with chocolate chips and Hershey's S'Mores Baking Pieces. 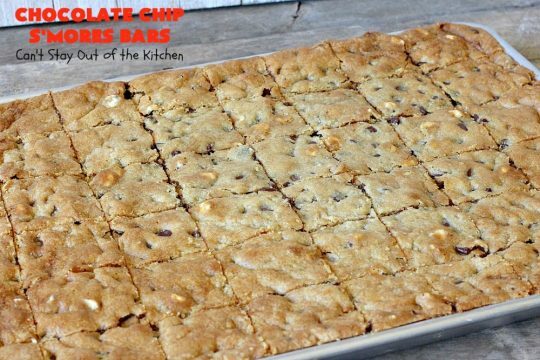 They make a spectacular brownie that's terrific for tailgating parties, potlucks, and backyard barbecues. Grease or spray a 13 x17” cookie sheet with cooking spray. 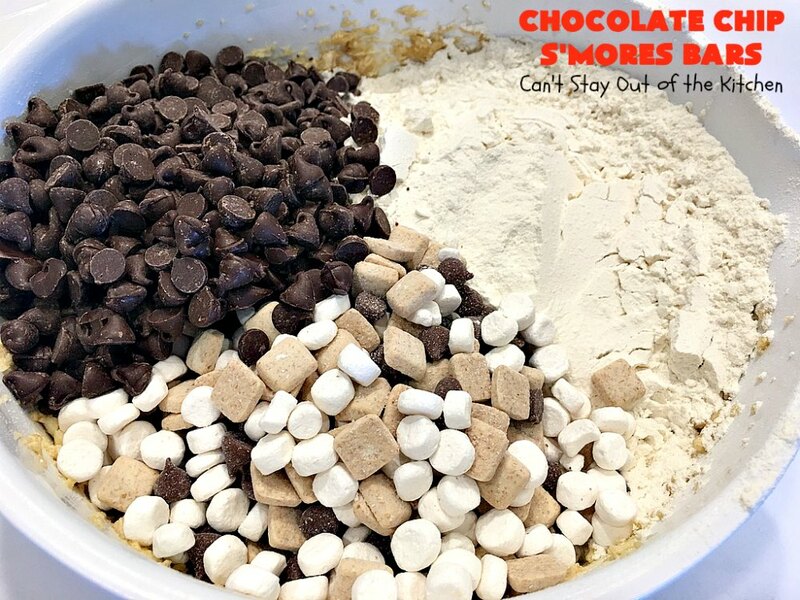 Stir in flour, S’Mores pieces and chocolate chips with wooden spoon until combined. Press dough into prepared cookie sheet. Bake at 350 degrees for 30-40 minutes, or until a toothpick inserted in center comes out clean. Chocolate Chip S’Mores Bars are also a spectacular brownie recipe for holiday baking and Christmas Cookie Exchanges. 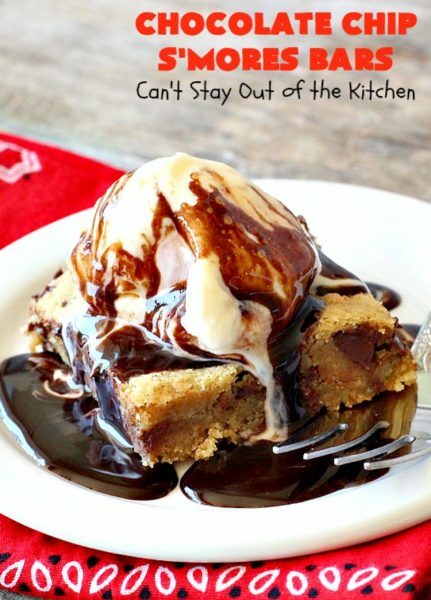 Whether you serve them with ice cream or not, these dessert bars are so awesome. 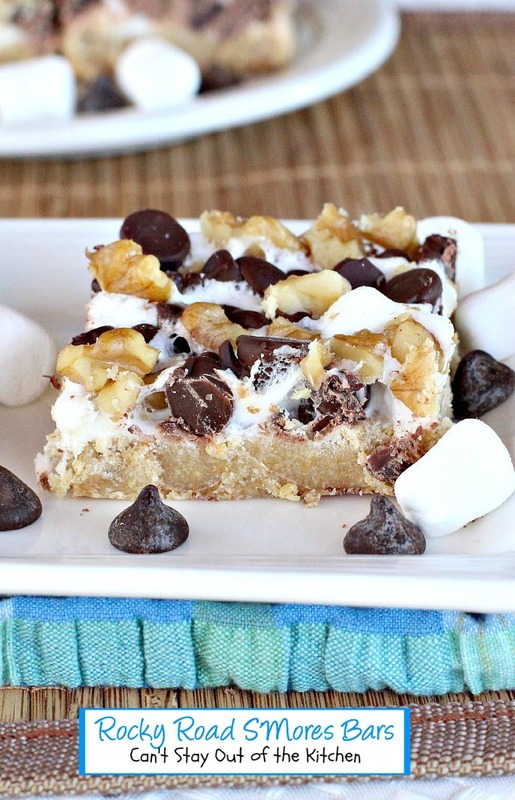 Chocolate Chip S’Mores Bars will surely cure any sweet tooth craving you’re having. 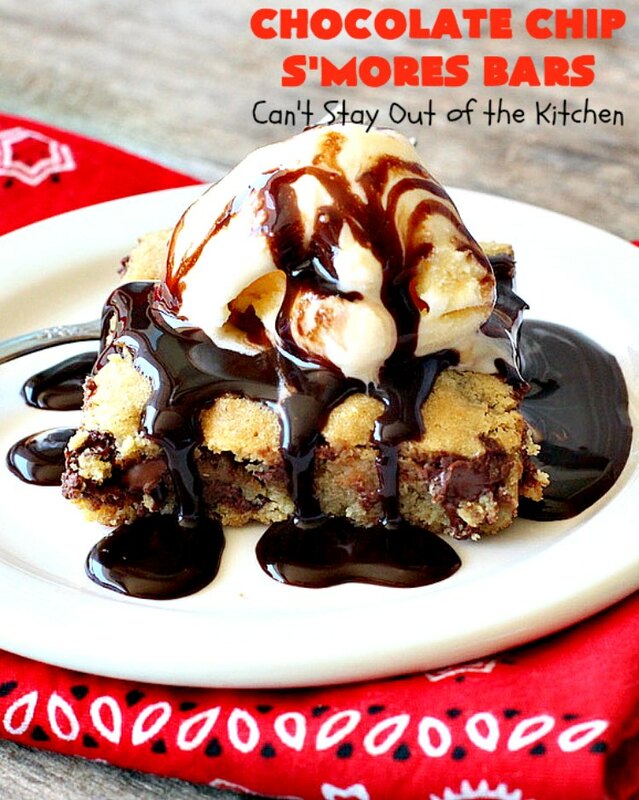 Chocolate lovers will get a double dose in this amazing dessert. Be warned! 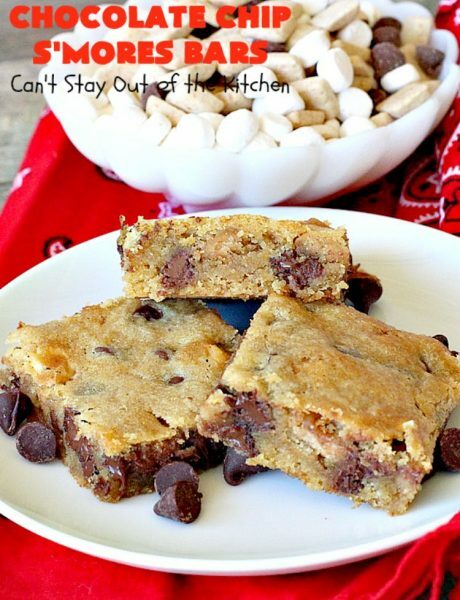 Chocolate Chip S’Mores Bars are addictive! Wow I’ve never seen those s’mores chips before! Those bars look to die for Teresa! Pinning! Oh, Kim, they were sooooo good. 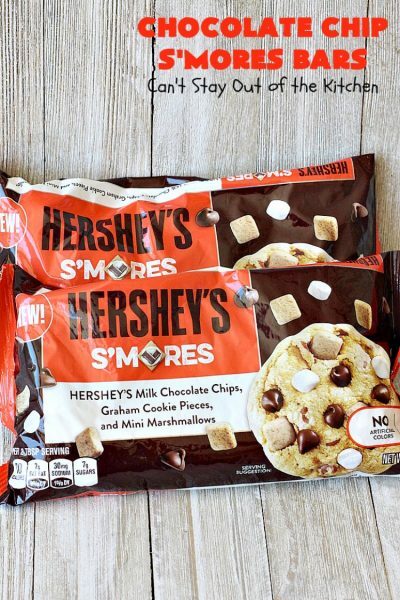 I loved those S’Mores chips but they are really hard to locate. If you ever see them in any store, you ought to pick them up while you can!